Then you can come back and keep reading this post with what I hope will be newfound appreciation for humanity, the world, and (most importantly) these adorable cookies. One of the reasons why Baymax is so lovable is because he is the world’s best friend. Sure, he’s programmed to be a health care companion–but (and here’s a vague spoiler for those of you who completely ignored my advice above–I’m not even going to feel bad about sharing this!) by the end of the film, he’s so much more than that. Whether he’s giving fa-la-la-y fistbumps or the best hugs ever, Baymax gradually learns the value of everyday compassion and empathy for others, and that lesson is definitely part of the reason I love this film so much. This weekend, I finally had a day to spare and decided to put that lesson into practice with a bit of a gratitude exercise. 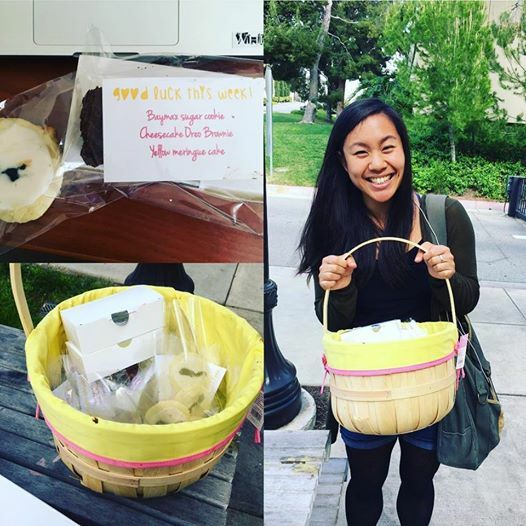 The mission: deliver these cookies to friends before the start of finals week! I didn’t glide around San Fransokyo on my own personal Baymax (boohoo) so it took a while longer than I anticipated, but in the end 20 cookie care packages were delivered between 2 and 9 PM on Sunday! I was so exhausted after the non-stop excursion that by the time 11 PM rolled around, I was basically half-asleep on the boy’s couch and no amount of wheedling or teasing would rouse me from my pillow-hugging position. Hey, an object at rest remains at rest, right? What amazed me most about this little exercise was the overwhelmingly positive support and responses of my friends. The fact that folks signed up for cookies and continue to put up with my extremely cheesy gratitude projects always blows my mind–for example, right now my friend and I are exchanging weekly gratitude emails to share the things that we appreciate most in our daily lives–but I’m glad it all worked out in the end. 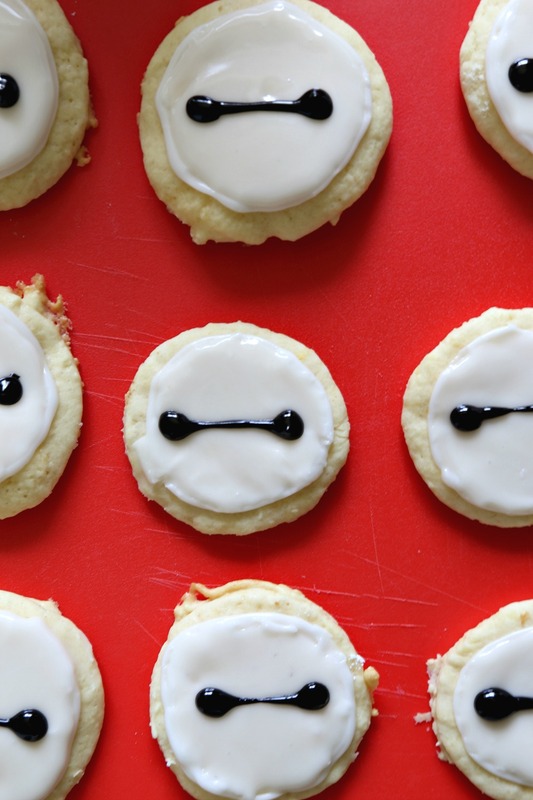 Nobody even cared that the Baymax cookies got squished and mutated during my long journey abroad (whoops! ), a fact for which I am extremely grateful. Also, there is no better feeling in the world than seeing your friends happy. I stand by this maxim, and I’m so glad to be able to call these amazing folks my friends. If you’re reading this: good luck on everything, guys, and thank you! 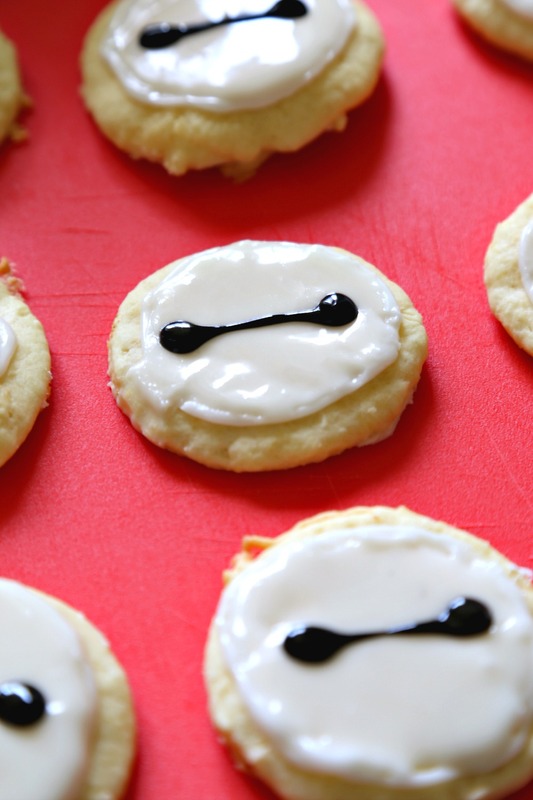 I hope you all take the time this week to make some Baymax cookies for your friends, too! What quality/qualities do you look for in a friend? In a large bowl, cream together butter and sugar until light and fluffy. Mix in eggs and vanilla. Fols in flour, baking powder, and salt. Cover and refrigerate dough for at least 3 hours (and up to 3 days) before handling. When you're ready to bake your cookies, preheat oven to 350 degrees F.
Place a sheet of parchment paper on top of a cutting board.. Using a rolling pin, flatten out your dough until it is 1/4-inch thick. 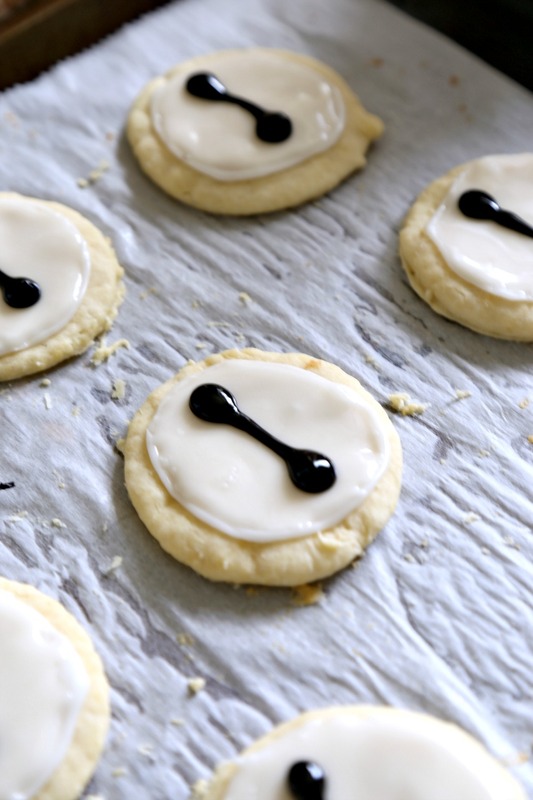 Use a circle-shaped cookie cutter to cut out shapes, peeling away extra dough as needed. (You can use dough scraps to make more cookies as well.) Transfer entire sheet of parchment paper onto a cookie sheet. Bake in preheated oven for 7-9 minutes. 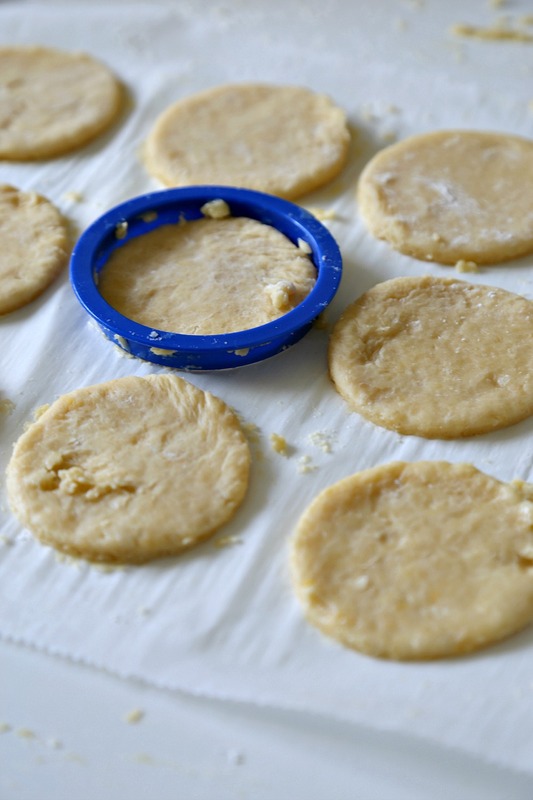 Allow cookies to cool completely before icing. In a large bowl, whisk together all ingredients until smooth.Pour 2/3 of your icing into one piping bag. Pipe a large white circle onto each cookie. Allow icing to set. Add black food coloring to the remaining 1/3 icing and stir in until uniformly black. Transfer to a second piping bag. Start with a circle in the middle left of your cookie. Release some of the pressure from your bag and pull across the cookie in a straight line. Once you reach the middle right, apply more pressure to create a second circle. Allow cookies to set completely before enjoying! Are you satisfied with your cookies? I live under a rock — I’ve never even heard of that movie! But if these cookies are any indication of the quality of the movie, it’s a must-see! hah! That’s all right, now you’ve been enlightened 😉 go forth and watch! I prefer Bae-Max. 😀 These are so pretty and oh how I love that movie. You look so cute in your photo, Ala.
hehe right?! I love that name. Thanks so much, Jhuls–same to you!! <3 hope all is well. I’m with John, I’ve never even heard of this film you speak of, and normally I am all over the kiddie flicks. I will take your word for it and watch it while eating all of these delicious cookies. Whaaat, no! You absolutely must watch this one, you’ll LOVE it, gal. But yes to eating these cookies during!! not sure how i hadn’t seen this post before today, considering how much i enjoy/enjoyed bh6, or considering how i still get watery when the videos resurface or when my fave seemingly leaves forever. love how easy it is to recreate baymax’s face!